Now is that time of the year when companies are going back to the drawing boards for Strategic Planning. C-Level executives are busy these coming days retreating into their war-rooms with their reports and scrambling about the figures from last year only to realise that much of their strategies have failed to work. What is it about strategic planning that we tend to get wrong? The practice of Strategic development is as old as civilisation itself. The earliest evidence have been seen etched on the walls of Egypt as early as 1303 BC when Ramses II immortalised his conquest of lower Egypt. Sun Tzu came out with many of his treatise regrading the “Art of War” back in 772-481 BC and Machiavelli wrote The Prince supposedly around 1513. There has been much strategy and conquest since those times. Michael Porter wrote the bible of corporate strategy in “Competitive Advantage” while Kim & Mauborgne later wrote “Value Innovation” in what was later popularised as “Blue Ocean Strategy” in 2005. Battlefields have transitioned to boardrooms after the industrial revolution and yet we still have much to learn about how strategy is executed into reality. The problem with strategy is really not about the strategy itself but rather Its failure in “execution”. “Execution” is the item for reckoning and the fact that many C-Suite executives are scrambling at this point is due to the fact that they have failed many aspects. In a research conducted by The Economist, they found that around 80% of C-Suite executives are cognisant of their roles in developing strategy and building execution but the same research also reveals that only around 56% of strategic initiatives have been successfully implemented. What are the reasons for this disconnection? Strategy is a Statement: It is that set of VMOGs (Vision, Mission, Objectives and Goals) written on a big plaque just as you enter the office. Everyone has this memorised but not everyone one knows what it means when they get into their cubicles! Strategy is an Action: In this best scenario, everyone knows and acts according to where the ship is meant to sail. They have a clear understanding of direction and how to get there. Strategy permeates every single task that they do and they are aware of their contribution to it. 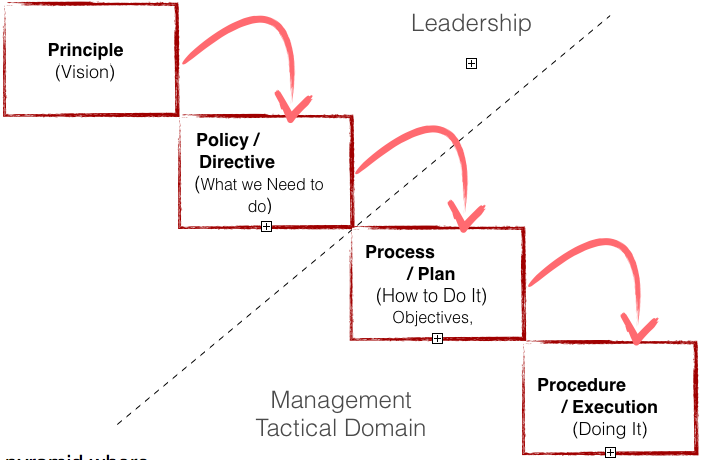 In the best cases of a typical “top-down” scenario, there is smooth transition between the strategic and tactical domains and everyone knows what to do. They have a clear understanding and commitment to their contribution to the overall strategy. In an alternate approach strategic development could also be driven from an inverted pyramid where people down the line are recruited to developing top-level strategies. In this way, strategic planning turns into democratised process that ensures collaboration at every stage; from development to execution planning. The process tends to be inductive rather than deductive. By engaging people who primarily work within the operational domain, strategy is better understood to include the strategic and the operational perspectives. Cross functional collaboration also ensures that strategy is understood down the line by making sure that everyone is looking at the same thing. Everyone knows where they are amidst competition, where they need to be, what they need to do and how to get there. The key to jumping the execution hurdle is never going to be about answering the “whats, where” and the “hows” but rather the “WHOS”.The most often overlooked partner to strategic effectiveness within the organisation is usually the HR Department. Organisations have a wellspring of talent who can move up from the tactical domains to the strategic domains. There is huge catchment of talent waiting to be developed. HR could also facilitate and create the processes for inclusion and collaboration between levels to develop and execute an effective strategy. Perhaps the “people championing” role has relegated HR into a supportive rather than a hard strategic role over the years but that also needs to change to deliver the numbers.